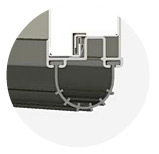 A U -shaped vinyl or neoprene weatherstrip retained in an aluminum extrusion fastened to the bottom of the bottom section. This rubber stays flexible during cold periods and ensures that wind and rain cannot penetrate between the floor and door. It stays flexible and efficient even at -62°F (-52°C). For better efficiency, make sure to have a positive slope threshold to the outside of the door.